Being overweight is often linked to health problems, but is there any truth behind claims you can be healthy at any size? It’s no secret that across the world, our waistlines are expanding and our body weight is increasing. Being overweight or obese is often linked to a suite of health issues and conditions. But is it possible to be overweight and healthy? According to the World Health Organisation, worldwide obesity has nearly tripled since 1975. Here in Australia, the results aren’t looking too good either. 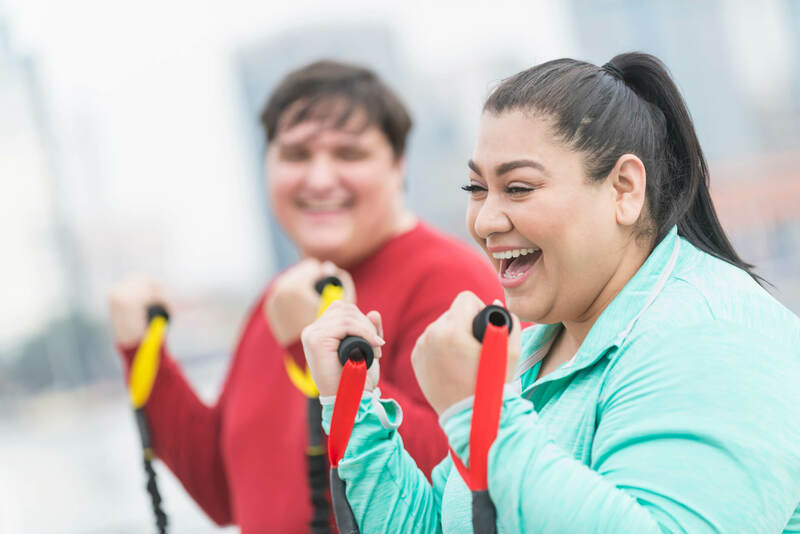 The Medibank Better Health Index found that in 2017, 34.5% of Australian adults aged 18 and over were considered to be within a healthy weight range, while 62.7% were considered to be overweight or obese. Whether you can be overweight and healthy has been hotly debated amongst some public health professionals. Some have argued that an overweight or obese person who doesn’t experience conditions associated with an unhealthy weight, like type 2 diabetes, high blood pressure and high cholesterol, could be considered healthy. This is referred to as metabolically healthy obesity, however the definition differs from study to study. You may also have heard it referred to as ‘healthy at any size’, or ‘fat but fit’. While this theory implies that someone with a high BMI can still be healthy, the majority of the research into metabolic healthy obesity concludes there is no healthy increased weight pattern. That’s because even if someone who is overweight or obese doesn’t have a weight-related condition, they are still at higher risk of developing one than someone who is a healthy weight. For example, one recent study that followed 520,000 people over 12 years found that despite being what some research has defined as metabolically healthy, those who were overweight or obese were more likely to develop cardiovascular disease than people in the study who were a healthy weight. This includes complications like heart attack or stroke. Being overweight or obese is also associated with a range of other health issues, including Type 2 diabetes, some types of cancer, sleep apnoea, osteoarthritis and polycystic ovary syndrome. Traditionally, body mass index (BMI) has been used as the formula of choice to calculate a person’s healthy weight range. If you have a BMI greater than or equal to 25, you are generally considered to be overweight, and those with a BMI greater than or equal to 30 are considered obese. The BMI scale is useful to indicate a healthy weight range, doesn’t require expensive equipment, is non-invasive and can be done anywhere. However the BMI scale is limited as it doesn’t account for things like age, ethnicity, gender, physical disability and body composition. So while BMI is a good starting point, determining what weight is healthiest for you depends on a range of factors. If you’re concerned about your weight, a check-up with your GP is a good place to start. They can provide a personalised assessment and advice on healthy lifestyle changes – maintaining a healthy diet and regular exercise are usually the key. The good news is, you don’t have to be a full-blown cross-fit enthusiast to have a positive impact on your health. Participants of a small-scale US study who lost just 5% of their body weight showed improved function of insulin-secreting beta cells, insulin sensitivity in fat, liver, and skeletal muscle tissue - lowering their risk of developing diabetes and cardiovascular disease. Total body fat had also decreased, and fat in the liver was reduced. While more research is required, this study suggests losing even a small amount can benefit our health. Inspired to get active? Medibank’s Free + Active events are held all over Australia, and are the perfect excuse to round up some friends and get involved. How do I know if my child is a healthy weight?